The most magical place in the sunshine state! Are you looking for that vacation that brings you closer than ever to the entertainment and excitement that Florida has to offer? A city where thrill seekers come to find the holy grail of true enjoyment? If so, then Orlando might just be your ideal destination for your Grad Trip. Orlando isn’t just a city that takes the idea of fun and puts it into a whole new level, it’s a city that is begging you to enjoy the true taste of enthusiasm! If you’re interested in seeking the adventure of feeling the adrenaline pump right through you, you might want to try Universal Studios® & Islands of Adventure®. If you’d rather the family side of Orlando, you may be more interested in Disney World® and its theme parks and water parks. If theme parks aren’t all you want to experience, you may want to travel up to the Space Coast to see the majestic Space Shuttle Atlantis™ at the Kennedy Space Center®. Whatever you are looking for, it’s waiting for you here in Orlando, FL. This Orlando package is 100% customizable to what you and your friends want to do. Below are some of the options you can choose from. Interested in taking a day trip to the beach? Daytona Beach and Cocoa Beach are only a ONE HOUR drive from Orlando. Looking for a hotel that can accommodate you while traveling to Disney World® and other Orlando attractions? Then come stay at Lake Buena Vista. 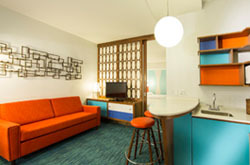 This centrally located resort is only a mile away from the Downtown Disney® Area and serves as a home base for anyone wanting information and a hassle free Disney trip. Heated outdoor pool, 3 restaurants, fitness center, room service available, free high-speed wireless Internet, multilingual staff, laundry facility, and continual transportation to Disney® theme parks. Accommodate yourself in one of Orlando’s hottest, newest resorts in the Universal Studios Resort family. This resort is full of spacious rooms, immense pools and colorful poolside attractions and is conveniently located minutes away from Universal Studios®, Islands of Adventure® and CityWalk®. 2 Pools with poolside attractions, a lazy river, ‘Atomic Tonic’ fruit bar and frozen beverage, 3 restaurants and minutes away from the Universal Studios® property. The resort offers 1,800 guest rooms, family and single suites. 2 Double beds or 1 king size bed, with kitchen appliances and beautiful dining room areas. Come, stay, and have fun at the renowned CoCo Key Hotel and Water Park! This isn’t your typical hotel, it also includes three different water parks for guests to enjoy. Imagine staying at a resort where you can walk a couple of feet out of your room and enter a water park for your own pleasure. 3 pools (1 heated + Jacuzzi), 3 outside water parks, onsite gym for hotel guests only, 5 restaurants (including Grab n’ Go), transportation to Orlando attractions & theme parks, and outdoor lounge with snack bar. The resort offers 391 rooms and suites. 2 Double beds or 1 king size bed.